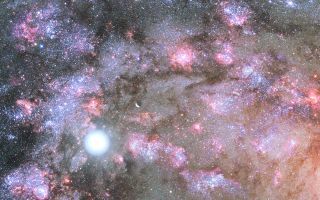 This space wallpaper reveals the celestial fireworks deep inside the core of a developing galaxy in the young Universe, as seen from a hypothetical planetary system. This space wallpaper reveals the celestial fireworks deep inside the core of a developing galaxy in the young Universe, as seen from a hypothetical planetary system.The sky is depicted as ablaze with the glow from nebulae, fledgling star clusters, and stars exploding as supernovae. The rapidly forming core may eventually become the heart of a mammoth galaxy similar to one of the giant elliptical galaxies seen today.